5 December - As a long and nasty House of Commons sitting comes to a close, members of Parliament showed a bit of holiday spirit on the Hill on Thursday that would hearten even the most jaded of politicos. MPs whose parties are normally duking it out in question period held a joint press conference to advocate for three people locked in jail abroad. 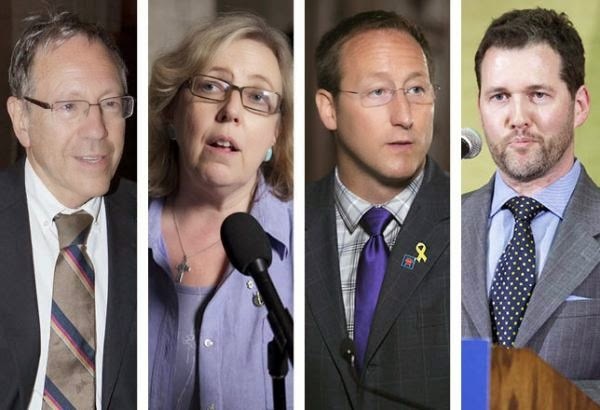 On the eve of the first anniversary of South African anti-apartheid icon Nelson Mandela’s death, Justice Minister Peter MacKay joined Liberal MP Irwin Cotler (a former justice minister himself), Green Party Leader Elizabeth May and Conservative MP Scott Reid (chair of the House foreign affairs subcommittee on international human rights) to call for the release of three people they called political prisoners and “Mandelas” of their countries. NDP MP Tyrone Benskin was scheduled to appear as well, but Mr. Cotler said he couldn’t make it because he was attending a committee meeting. The following are excerpts from their remarks. They are edited for style and length. MacKay:…Ladies and gentlemen…it’s very poignant that we gather at this time on the eve of the anniversary of Nelson Mandela’s death, knowing that there are similar leaders currently incarcerated for their struggle to bring about freedom and democracy and greater human rights in their countries. And we’re truly gathered here in the name of justice and in that spirit of Nelson Mandela to support three extraordinary people who are enduring very unfavourable circumstances as political prisoners and who have been characterized as Mandelas of their countries. And while most will agree that there is no single person alone who is like Nelson Mandela, these three who we speak of today are among others who in fact embody the spirit of leading the struggle for a free and democratic country for their people. The promotion and protection of human rights is an integral part of the Canadian justice system along with its foreign policy. Canada takes principled positions on important issues to promote freedom and democracy and human rights and the rule of law. And being here with my colleagues from the Canadian Parliament in a unified expression of our support for those who promote these values in their countries is similarly an expression of what a non-partisan issue truly is. Today, I’ve been asked to speak about one of these three political prisoners, an extraordinary man, currently incarcerated in Iran [for advocating] separation of religion and state, for condemning the theocratic nature of the Iranian regime, which he feels drives people from religion. And he’s been an advocate as well as having called for a referendum for a free Iran…like Mandela, he’s spent years now, eight years in fact, behind bars for his unrelenting and unrepentant views. Ayatollah Boroujerdi wrote an open letter to the [Iranian] supreme leader, Ayatollah Khamenei, accusing him of being responsible for the violations of human rights in Iran, and calling for a free referendum in Iran directly supervised by UN observers. As a result of vocalizing criticism of Iran’s authority and the system, calling it both “a totalitarian and corrupt dictatorship where the crown has been replaced by the turban,” he was charged with waging war against God and spreading propaganda against the system. In the past eight years, while he’s been in prison, due to poor health and poor prison conditions, his health has continuously deteriorated as well as the worsening of a pre-existing condition that he has. He’s continually been denied the medical attention that he needs. I find it an honour to be here today with two of my parliamentary colleagues [Mr. Reid had not yet arrived] who have both been outspoken advocates for prisoners who are held for reasons beyond our understanding in Canada, because of our own democratic rights and freedoms of expression here. But I do believe that ultimately that our justice system is only as effective as the strength of the public’s trust in it and governments must continuously strive to ensure that their justice system evolves with their citizens. May:…I speak to the case of the man in his country, Mauritania, known as the Mandela of Mauritania. His name is Biram Dah Abeid. He has been arrested for campaigning to end a practice that is already illegal in Mauritania. Several times, Mauritania has passed laws against slavery. And yet, the shocking statistic is it’s estimated that 20 per cent of the population of Mauritania is currently enslaved. What Mr. Abeid was doing was working with a movement of which he is the president, a revival of an abolitionist movement holding rallies, travelling through the country, and pressuring the government of Mauritania to end the practice of slavery. We give our full support and we urge the government of Mauritania to release Mr. Abeid and the five others arrested with him and to put serious efforts to end the practice of slavery in Mauritania. I just want to make one other point. Some people think things like this aren’t possible, but if Irwin Cotler can get Peter MacKay and me together for a press conference, anything is possible. Cotler:…We had a week ago the visit of the wife of the imprisoned leader in Venezuela, Leopoldo López. She was here together with their counsel, Jared Genser. They appeared before the foreign affairs subcommittee on international human rights, which is chaired by Scott Reid. That’s not true. Our committee functions—it’s actually the only committee or subcommittee that functions this way—completely on consensus. We never move forward on any item that does not meet with a consensus. We can’t pass a resolution without consensus. We don’t invite witnesses without consensus of all the parties. As a practical matter, that involves just the officially recognized parties, but as a statement of fact, we’ve always had the support of Ms. May as well in these matters. Leopoldo López is a distinguished, a very distinguished, Venezuelan democrat who is deeply respectful of his country’s constitutional heritage and, if I may say, its spiritual heritage dating back to Simón Bolívar, and who has attempted to move forward that agenda in the face of a government which having lost its—having maintained a revolutionary ideology but having lost its way—now seeks to stifle those who would enact the genuine ideals of the Venezuelan people of Venezuelan nationalism. He’s served as a public servant, but has been imprisoned in recent years as a result of his outspokenness. His wife came and testified before our committee very movingly and I think her testimony speaks for itself as does our motion in his support. I’ll stop there. Thank you. Cotler:…I was here 36 years ago. At that time, I was a law professor. I was here with Avital Sharansky…the wife of the then-imprisoned Soviet dissident, Anatoly Sharansky. We had one person here for a press conference and the person who was asking the questions, sort of you know, “What is this going to do?” Nobody really came, etc. So let me just close by telling you a story, that in 1984, [former Soviet leader Mikhail] Gorbachev visited the Canadian Parliament. Sharansky was released…within a year of Gorbachev [becoming] the head of the Soviet Union. I met Gorbachev years later, we were on a panel together and I asked him what was his role is Sharansky’s release. And through a translator, he answered me as follows, he said, “You may not believe this, but when I came to Canada, I had never heard of Anatoly Sharansky. I knew that he had become a household word in Canada, but I had never heard of him,” he said. That’s the power of, you know, public advocacy on behalf of an imprisoned dissident and political prisoner.